When you buy a car, you might kick the tires, maybe peer into the wheel well to look at the leaf springs or torsion bar, perhaps push down on the trunk lid to test the firmness of the suspension. Do shoppers pay as much attention to a compact track loader’s undercarriage? Well, probably not as much as they should. Yet the undercarriage should be a main attraction in any track loader sales transaction — partly because there are a variety on the market to choose from — rigid, roller and torsion. A rigid system, of course, is affixed directly to a loader frame, a roller system suspends rollers to minimize vibration and jolts and a torsion axle system lets the main frame move somewhat independently from an undercarriage. The two non-rigid systems are mostly about operator comfort. 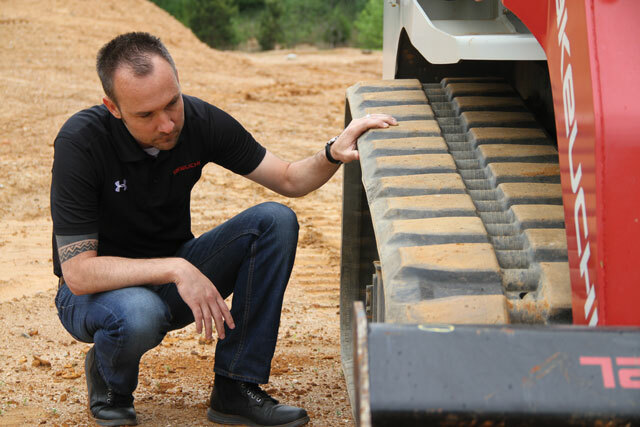 “The biggest benefit of suspension is going to be an enhanced ride for the operator,” acknowledges Mike Fitzgerald, Bobcat loader product specialist. “The person in the seat feels less vibration and impact.” In addition, a loaded bucket is spared some of the ups and downs experienced with a rigid system. Bobcat’s smallest track loader, the T450, comes only with a rigid undercarriage because it is too small to incorporate suspension components, but the 500, 600 and 700 series Bobcats can be rigged with either rigid or suspended roller systems. The larger Bobcat model, T870, comes only with a torsion system. It features a fifth link in the rear axle that mitigates the rocking sensation and allows some forward and backward undercarriage movement. Caterpillar finds that once a customer is educated about the benefits of torsion suspension they see how it directly improves productivity and reduces operating costs. Caterpillar, which first introduced torsion suspension for a compact track loader in 2008, uses it as standard on all seven of its models. “Our design offers the best of both worlds, full suspension on a very durable, rugged roller frame with steel rollers and idlers that are sealed for life,” says Brown. 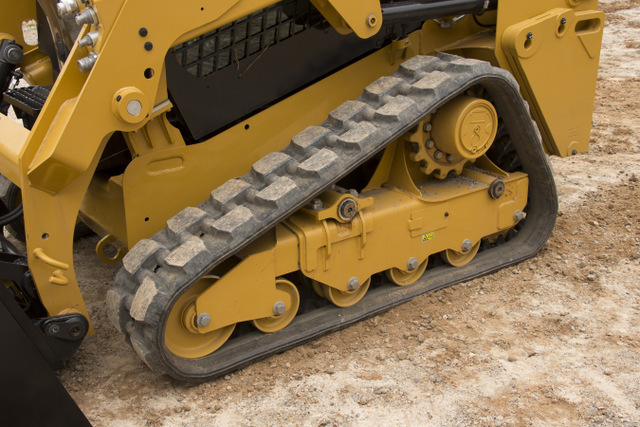 In fact, Caterpillar also offers a unique bar tread track that reduces ground disturbance, improves traction in snow or slippery conditions and further improves ride. Over at JCB, all track loaders are rigidly mounted on undercarriages. The manufacturer believes a rigid mount produces better traction, delivering more ground-bearing pressure on the tracks. “We have always used a rigid system and have not changed the track design in more than eight years. We are very happy with the system we have and feel there’s no reason to change it,” says Tinley. On the other hand, most Takeuchi loaders now have what the manufacturer calls “a quiet track design” that benefits the person operating it as well as the surface the machine is crossing. The design incorporates larger tread pads to increase flotation across delicate turf as well as a rubberized interface pad between the roller and track to reduce vibration. Durable rubber coated UHMW rollers on ASV loaders flex more than the steel wheels on some rival machines, additionally cushioning the loader, and more rollers are incorporated to spread the weight and increase flotation. “The torsion system is beneficial in all loader applications,” says Storlie. Inevitably, dirt and debris will build up on/in the undercarriage and keeping that area as clean as possible is critical to maximize life of the components. 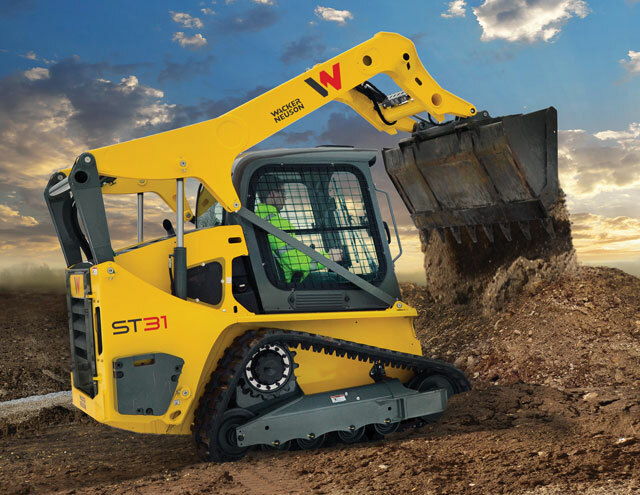 One development in track loader undercarriages eliminated a maintenance routine — track tensioning. 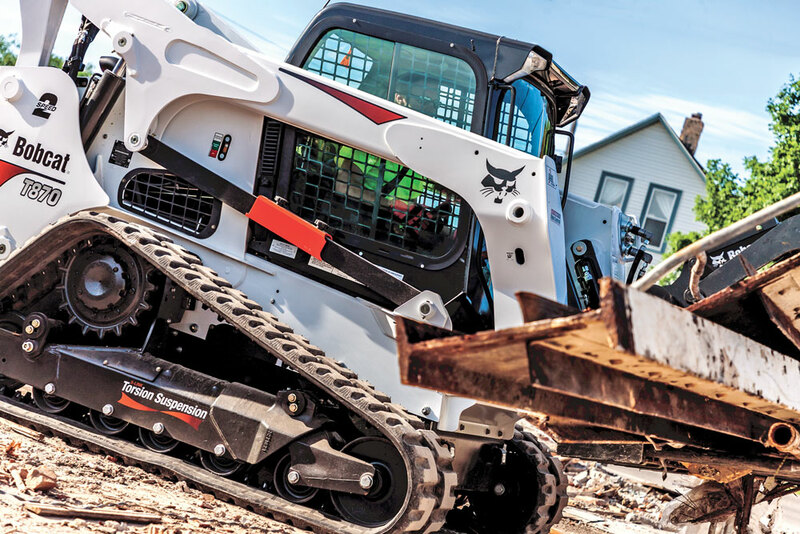 Bobcat’s T870 taps into the machine’s hydraulic system to tension the track, instead of an operator regulating tension through a grease fitting. The T870’s track tension is automatically adjusted at every startup of the engine, so an operator doesn’t need to get out a grease gun. A valve on the tensioner can be adjusted to set for a desired tension. And, of course, how well a track loader undercarriage holds up is partly dependent on how well a loader is operated. Not cleaning out debris shortens component life. Spinning a loader on jagged rocks tears up tracks. And when an operator is tensioning track, he or she should lift the front end of the loader with the bucket so that the track actually is tensioned, rather than stretched. “Doing that will guarantee longer track life,” advises Tinley. Another disappointing article. Have you ever heard of John Deere track loaders??? We have. We focus on the John Deere brand in nearly every other story on this site, but we can’t include them in every story. There are at least 16 track loader manufacturers selling in America. We can’t possibly include them all in every story, so chill, brah.